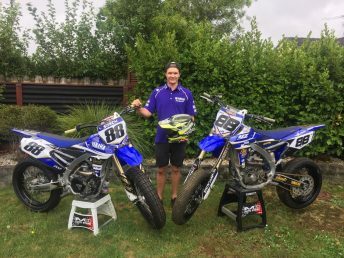 Sam Smith will swap four wheels for two when he debuts in the New Zealand Supermoto Cup at Max Motors Wellington Family Speedway this weekend. Smith began his racing career on two wheels contesting the motorcycle road racing scene in Australia and on the New Zealand Superbike Championship support card. In 2008 he won the New Zealand Supersport Championship title for 600cc bikes on a Yamaha YZF-R. However, his road racing career came to an abrupt end when injury meant he couldn’t carry on racing. With a style of driving that was less taxing on his body, drifting was the next logical step for Smith. In 2011 he joined the D1NZ National Drifting Championship, and for two seasons piloted a Nissan Silvia S15. “I got into drifting because it was much safer,” Smith said. Having had his time in the drifting scene, Smith went away again and got back on the saddle, riding off-road bikes, and getting a feel for the style of riding. Smith hasn’t competed at the national level for several years now, but he’s excited to get back into the competition arena. Supermoto racing will be a new experience for Smith who hasn’t done much in the way of mixed surface events. Supermoto races typically see riders race on custom built courses with dirt and asphalt combined with jumps and sometimes obstacles. Smith said he’s keen to get out on track and experience a completely new track, which he said will really even out the playing field. For Smith, seeing a new course and series launched is encouraging for him as he said it can only do good things for the sport. “It’s really exciting and cool that a group of people have got the imagination and drive to do something a bit different. It’s quite a fresh approach for the sport and for New Zealand as well. Smith said he hopes the series can continue to grow with the support of the riders, teams and Motorcycling New Zealand. “I’m genuinely just looking forward to riding something that is completely new. It’s something that as far as bike set up goes there’s nothing really that you can 100 per cent practice for the track they’ve built. For more event information visit nzxms.co.nz and d1nz.com, for ticketing information visit iTicket.co.nz.